Senator Paul Tsongas had a secret when he ran in the 1992 Democratic presidential primary—his non-Hodgkin’s lymphoma had returned despite a bone-marrow transplant. Yet Tsongas and his physicians continued to claim he was “cancer-free” and his true medical condition became public only after his campaign folded. Had voters elected him president instead of Bill Clinton, Tsongas would have endured crippling cancer treatments and died in office, as he did just a few years later. “I don’t know if he could have even gone to the inauguration. It would have been a public policy disaster,” says Robert Gilbert, a political science professor at Northeastern University in Boston, Mass. 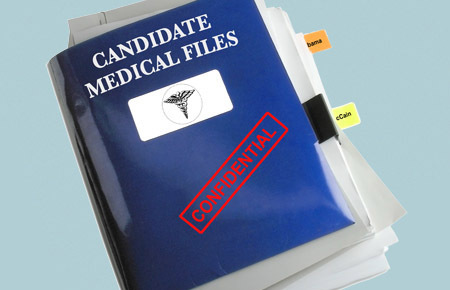 As the 2008 presidential race wears on, the medical records of presidential candidates remain shielded by federal law. None are legally required to disclose any medical conditions when running for commander in chief. But a number of historians, bioethics scholars and physicians have argued that medical privacy should not allow presidential candidates to hide serious health problems from voters. “If you get on a plane, that pilot gets a physical every six months,” observes Dr. James Toole, a professor of neurology at Wake Forest University Baptist Medical Center in Winston-Salem, N.C. Presidential candidates “need physicals,” particularly mental health examinations, Toole says, to hold them accountable to voters. At least ten sitting presidents suffered from some mental disorder while in office, according to a 2006 study in the Journal of Nervous and Mental Disease. Some current and past candidates have gone public with certain medical conditions. Senator John McCain’s campaign released thousands of pages of medical records relating to the candidate’s mental health in the 2000 presidential election, and the senator has said he will do the same in 2008 when he turns 72. Experts likewise suggest that a voluntary agreement on medical disclosure could provide a starting point for candidates to informally agree on some election ground rules. Yet voluntary disclosure is a somewhat “perverse” system that only encourages presidential candidates to reveal health problems when they don’t matter, says Robert Streiffer, a professor of philosophy at the University of Wisconsin in Madison. Expecting presidential candidates to come clean with medical conditions that would jeopardize their chances of winning over the public is naïve, says Streiffer, especially if history serves as any guide. Tsongas wasn’t the first presidential candidate—or president—to hide a serious ailment. President Woodrow Wilson concealed the fact that he had three minor strokes leading up to his run for the presidency. In 1919, after guiding the United States through World War I and attempting to set up the predecessor organization to the United Nations, Wilson suffered a massive stroke that left him paralyzed and blinded on the left side of his body for the remainder of his second term. “He was operating with great difficulty. He couldn’t have a cabinet meeting for nine months,” notes Robert Gilbert, who wrote several books on presidential illness. When Wilson’s vice president refused to take over, Wilson limped along in his presidential duties with the help of his wife, Edith, who decided which issues deserved the president’s attention. As a presidential candidate, Wilson’s deception about his earlier strokes resulted in the “disenfranchisement of the entire American people,” according to Streiffer. He coauthored a 2006 article in the Journal of Medicine and Philosophy along with several philosophers and a physician suggesting that presidential candidates have a moral duty to reveal certain medical conditions. The idea is that voters have the right to an informed consent of the governed, which includes knowing any relevant conditions that would seriously affect how a president may perform in office. At least one option now exists so that a president’s illness—whether concealed prior to the presidency or acquired during office—does not leave the nation rudderless. The 25th amendment to the U.S. Constitution was passed following President John F. Kennedy’s assassination to provide emergency options, such as the vice president taking over temporarily when the president is stricken. Former President Carter pushed further for the creation of a “nonpartisan group” of physicians to help decide when a president’s illness affects his judgment. In 1993, he published a speech in the Journal of the American Medical Association that led to the formation of the Working Group on Presidential Disability, consisting of scholars and physicians. “Doctors of previous presidents all said it [presidential disability] was a terrible problem,” says Toole, who helped get former presidents Carter and Ford interested in the issue. Toole and many physicians in the working group liked the idea of a nonpartisan medical panel. Sitting presidents customarily go through an annual physical with personal physicians, but the examination is not legally required. A similar process could also be applied to presidential aspirants in order to “certify that candidates are grade A,” says Toole. But Robert Gilbert is more cautious. As another former member of the working group, he fears such a medical panel could easily become politicized during election season. “What happens if the panel’s doctors disagree?” he asks. “Suppose there was a 4-3 vote? It would undermine the presidency.” Perhaps the 2000 election quagmire, decided by a 5-4 vote in the U.S. Supreme Court, serves as a reminder of how independent panels can be seen as undercutting rather than helping safeguard the right to decide who becomes president. Congress did not follow up or act on the temporary Working Group for Presidential Disability’s suggestions, leaving the situation still muddied today. The uncertainty even creates the opposite problem of voters struggling to sort through too much irrelevant medical information. The news media loves following up on every medical tidbit among the remaining presidential candidates, particularly focusing on Senator John McCain’s age and past medical history of skin cancer, enlarged prostate and wartime wounds. None of the experts interviewed for this article think those health issues should count against McCain in his bid for the presidency. However, that did not stop former Republican presidential candidates Mitt Romney and Mike Huckabee from sniping at McCain’s age—whether through ads or through campaign trail surrogates such as Chuck Norris. Health gossip might make for juicy headlines and provide ammunition for political mudslinging, but it can also distract from the serious question of whether a candidate is capable of being president. “Candidates have a lot of information that should be private, and you’re putting them at a real disadvantage by forcing them to disclose everything,” warns Wisconsin’s Streiffer. Gilbert and Toole agree that forcing presidential candidates to reveal all details of their medical records would leave voters “buried under a landslide” of irrelevant medical information—and that would go against the goal of making elections more transparent. The curse of the swing voter (why you might not vote for the thing you want). Fears of genetic discrimination leads some people to take matters into their own hands. We’re all still waiting with baited breath, for President Clinton’s med records – still unpublished. Why is he the only one with a pass?